Houston is stacked with great sports teams (well, for the most part). This means it’s also primed with great places to watch said sports teams utterly crush it. Astros forever! Whether you’re cheering on your Rockets, Astros, Texans, Dash, or Dynamo (or let’s be honest, some other, non-Houston team because everybody here is a transplant), we’ve got the perfect place in mind. 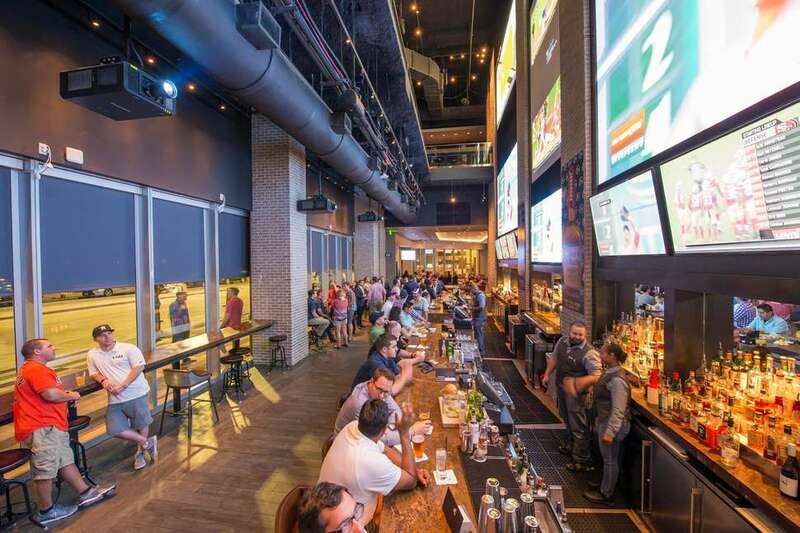 We went ahead and dutifully narrowed down the city’s watering holes to those with only the finest, most accommodating sports-watching setups, from shaded patio bars lined with high-def TVs to one Downtown bar that doubles down on monster, 30-foot screens. Let’s kick it off. The Midtown location of this beer-forward concept is pretty much covered in side-by-side flat screens inside and out, making it damn near impossible to have a bad view. You’ll have to take your eyes away from the game for just a second, though, because there’s an epic 365+ beer vault and solid roster of pub grub waiting for you -- think brew pretzels and cheese dip, hot wings, mac & cheese burgers, and short rib tacos. Specials run from $3 local draft Mondays to Steak & Brew Wednesdays. 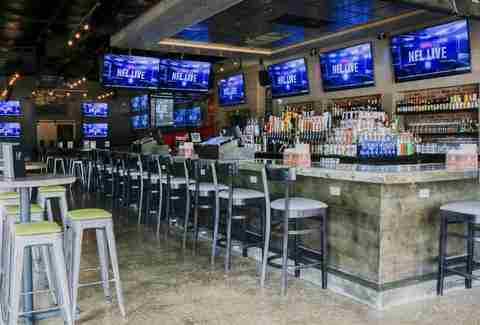 Located within walking distance to Dynamo Stadium, Minute Maid Park, and the Toyota Center, this massive bar is sports-watching central, drawing in enthusiastic fans on the regular. That’s thanks in part to the giant, 21-foot HDTV screen, plus the 50 other HDTVs in the main area and projection screens in every damn room. Fans can settle in with a generous roster of specials, plus a selection of 250+ beers -- available by the pint, can, bottle, bucket, and 32-ounce “smitcher” -- and classic bar bites from nachos and wings to burgers to 16-inch pizzas. In case you didn’t get a hint from its name, Biggio’s pays homage to Houston Astros legend and Hall of Famer Craig Biggio. The upscale spot sits inside Downtown’s Marriott Marquis (yeah, that’s the one with the Texas-shaped lazy river), impressing the crowd with two stories, soaring screens (including a duo of 30-foot high-def ones), an outdoor terrace, and first-come, first-served front row recliners. Watch your team and fill up on loaded nachos, chicken & waffles, and dirty bison chili dogs along with an ever-changing selection of local draft beers and craft cocktails made with local spirits. Houston’s OG sports bar has been keeping fans happy and full of beer since 1993. 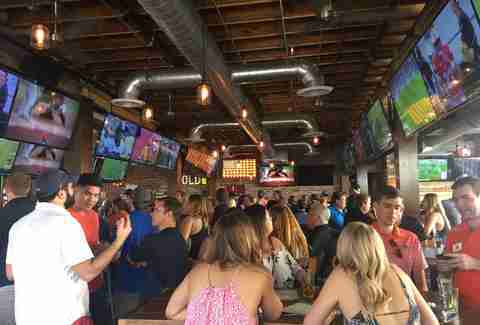 Don’t expect a ton of frills here, just good food, a solid screen setup, and “all sports all the time.” The convivial neighborhood spot serves breakfast, lunch, and dinner, offering not-so-average grub from jalapeno cheeseburger sticks to pizzadillas. Those looking for the classics can stick to wings, nachos, burgers, and bar pies (naturally). 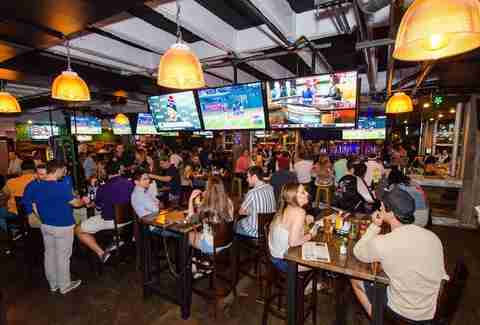 You can expect this popular Midtown bar to be packed on game day, but that’s OK, because there are 80+ flat-screens smartly placed around the bar for your viewing pleasure, both indoors and on the covered outdoor patio. 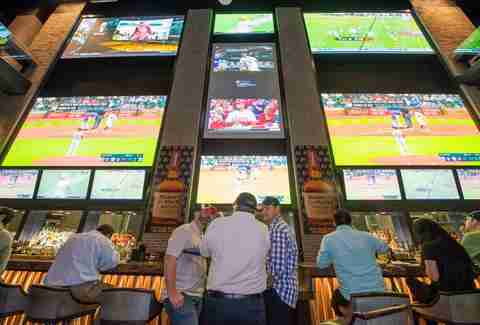 The HDTVs are numbered so that you can request a specific game on a prime screen if you show up early enough (doors open at 10:30am on weekends); and the bar carries every sports package to cover every game. While you’re losing your DraftKings Double Up, you can drown your sorrows in craft beer, double-fried, double-sauced wings, truffle chili tots, and Game Day specials. This laidback bar is a hit with fandom of all kinds. That’s because it offers 51 beers on tap, a full bar for craft cocktails and wine, a great selection of high end bourbons and whiskeys, plenty of high-def TVs inside and out, a high-def TV and audio sports package, and a seriously expansive backyard that rocks food trucks and tons of seating. All is well as long as those fans are at least 23 years old, because no one 22 or under is allowed (don’t worry, your dog doesn’t count). Every location of Little Woody’s offers a laid back vibe and ample televisions, but the Midtown iteration is the real deal when it comes to game day. After getting some much needed botox in the last few years, the indoor/outdoor bar has transformed in an absolute oasis for the 21-and-over crowd. Grab a swing seat or shaded table and cheer on your favorite team, and look out for specials like the 3-4-5 dollar happy hour and Altuve shots, and $1 hot dogs during select Astros home games. Frequent flyers should check out the Big 50 Club for the chance to drink 50 beers and be immortalized on the Big 50 Wall of Fame. Could it be you? It could! 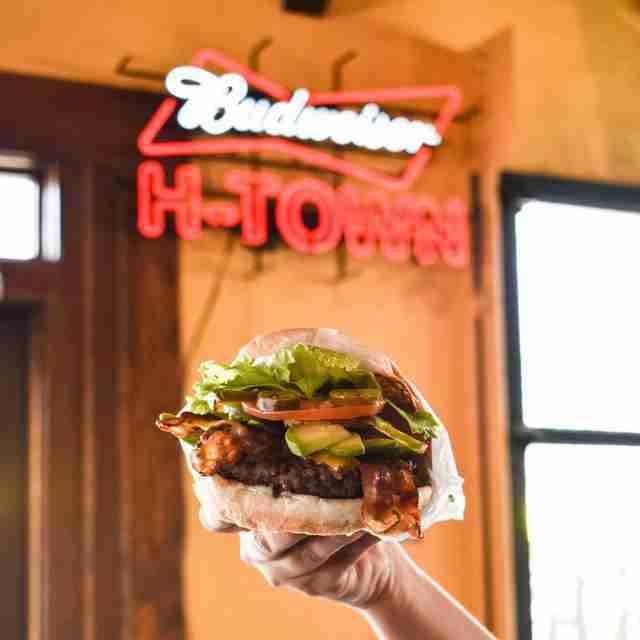 Though the one-pound burger is this cult favorite sports bar’s claim to fame, you’ll also find tailgate classics including wings, nachos, chili cheese dogs, and pulled pork sandwiches. PLUS cheap pitchers, an extensive TV spread, game day happy hours, an energizing atmosphere, a rowdy crowd, and Saturday night karaoke. But back to those heart-clogging burgers. Get ‘em loaded with country fried bacon, mouth-burning jalapeños, crispy onion rings, caramelized ‘shrooms, and cheese. Always get the cheese. Houston’s first full-fledged soccer bar sits just a block away from BBVA Compass Stadium -- home of the Houston Dynamo and Houston Dash. A lineup of 20 strategically placed TVs broadcast futbol matches from around the world, making it the ultimate soccer fan destination (though you’ll find the bar showing American football games as well). 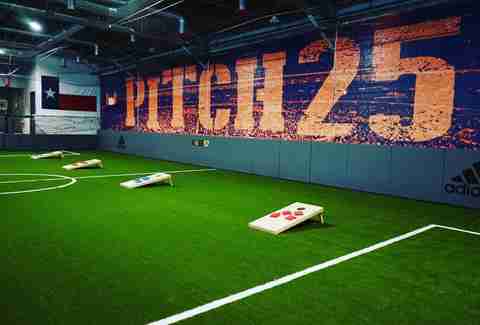 An extensive beer list, 100 taps, indoor and outdoor bars, and an indoor soccer pitch help to fuel the fandom. A thoughtful, 40-tap library of rotating craft brews (many of which are local) make this sports bar one to frequent. Tack on nice-sized dog-friendly patios, a big screen and ample seating, happy hour and daily specials, specialty cocktails, and elevated bar food (like the H-town Fries complete with Saint Arnold beer-braised short rib) and you have yourself a real winner. Revelry lists its sports schedule every week so that you never have to miss a game. Ever. Ever want to watch your favorite sports team absolutely dominate from the comfort of your very own swing? 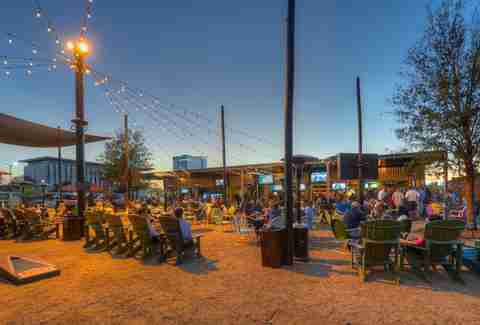 Well you’re in luck, because you can at this cool kids’ patio bar (which boasts covered and open-air seating, plus booths inside in case Houston weather decides not to cooperate). Rotating food trucks that carry your bar tab, a 50-beer selection, sangria and a house vodka-cider-lemonade on tap, and 49 TVs are also in the mix… all helping you win your day just as hard as your team did. Brooke Viggiano is a Houston-based writer who will be at one of these bars watching her DraftKings team kill it this Sunday. Share in her addiction on IG @brookiefafa or on Twitter @brookeviggiano.